State-owned Qatar Airways is attempting to buy a 10 percent stake in American Airlines, triggering U.S. antitrust oversight of deals that size. American said in a regulatory filing Thursday that the bid was unsolicited, but that there have been conversations between the CEOs of both airlines. Earlier this month Saudi Arabia, the United Arab Emirates, Egypt and Bahrain cut ties with Qatar and blocked direct flights with the country. 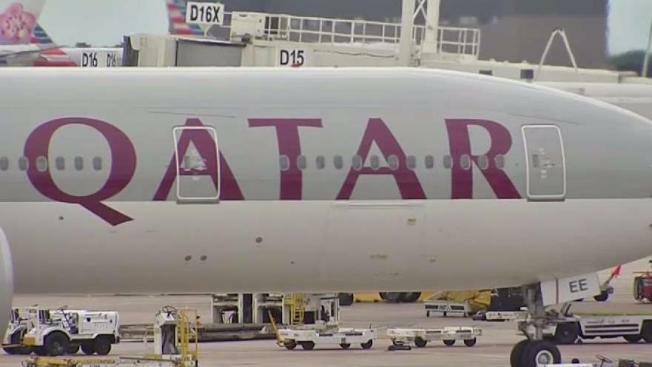 Qatar Airways, one of the region's largest, also stopped its flights to the four Arab countries in response to the UAE's Etihad, Emirates, FlyDubai, EgyptAir and Bahrain's Gulf Air suspending flights to Qatar. Qatar submitted a filing under the Hart-Scott-Rodino Act, which is subject to review by the Justice Department's Antitrust Division. American and Qatar are already members of the Oneworld marketing alliance, which allows passengers to earn and redeem points on each other's flights. An expanded partnership could make it easier for American passengers to get to smaller cities in India, and developing countries in Southeast Asia. But American, United Airlines, and Delta Air Lines have been pushing U.S. political leaders to curtail the growth of the Middle East's three biggest airlines, Qatar, Emirates and Etihad, saying that they are subsidized airlines that have competed unfairly. They also cut into lucrative routes overseas for U.S. airlines. Qatar plans to buy at least $808 million in common stock of American Airlines. American's shares are listed on the Nasdaq, and the airline said that Qatar plans to make its purchases on the open market. American's certificate of incorporation restricts anyone from buying 4.75 percent or more of its shares without advanced board approval following a written request. American says it hasn't received such a request. The airline also said that there are foreign ownership laws that limit the total percentage of foreign voting interest to 24.9 percent. Qatar's proposed investment wouldn't change its board makeup, governance, management or strategic direction, American said Thursday. In addition, American said it doesn't change the company's belief that there needs to be enforcement of the Open Air agreements with the United Arab Emirates and the nation of Qatar and fair competition with Gulf carriers, including Qatar Airways. Shares of American Airlines jumped nearly 5 percent following the news, CNBC reported.